Fig. 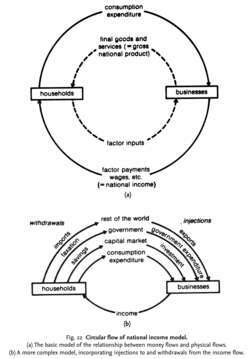 22 Circular flow of national income model. (a) The basic model of the relationship between money flows and physical flows. (b) A more complex model, incorporating injections to and withdrawals from the income flow. a simplified exposition of money and physical or real flows through the economy that serves as the basis for macroeconomic analysis. In Fig. 22 (a) the solid lines show how, in monetary terms, HOUSEHOLDS purchase goods and services from BUSINESSES using income received from supplying factor inputs to businesses (CONSUMPTION EXPENDITURE). In physical terms (shown by the broken lines), businesses produce goods and services using factor inputs supplied to them by households. The basic model can be developed to incorporate a number of ‘INJECTIONS’ to, and ‘WITHDRAWALS’ from, the income flow. In Fig. 22 (b), not all the income received by households is spent - some is saved. SAVINGS is a ‘withdrawal’ from the income flow. INVESTMENT expenditure ‘injects’ funds into the income flow. Part of the income accruing to households is taxed by the government and serves to reduce disposable income available for consumption expenditure. TAXATION is a ‘withdrawal’ from the income flow. GOVERNMENT EXPENDITURE on products and factor inputs ‘injects’ funds into the income flow. Households spend some of their income on imported goods and services. IMPORTS are a ‘withdrawal’ from the income flow. On the other hand, some output is sold to overseas customers. EXPORTS represent a demand for domestically produced goods and services and hence constitute an ‘injection’ into the income flow. See also AGGREGATE DEMAND, EQUILIBRIUM LEVEL OF NATIONAL INCOME MODEL. Circular Head Business Enterprise Centre Inc.